Hyderabad (Wednesday, May 02, 2018): The directorate of National savings of Pakistan will held balloting draw of Rs. 7500 Prize bond 2018 May in Hyderabad city today. This will be 74th draw of Seventy five Hundred Prize bond till to date of National saving’s History. 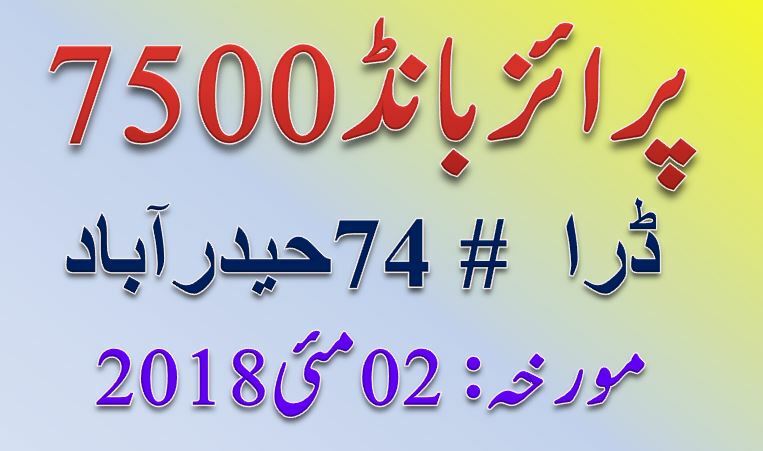 The complete draw of – Prize bond Rs.7500 02 May 2018 Held Hyderabad will be updates on this page very soon with first second and third prize winning numbers here. The 1st & 2nd winners Lucky number will be updates on this page first time at 9:10 am and full third winning numbers will be updated at late evening about 5:00 pm on this page. The full 7500 Prize bond list 16 May 2018 will be here very soon. Out satisfaction about winning above listed draw is only filled with first two prize categories but its hard to win for each of us. The department of National Savings is announces the all draws numbers. 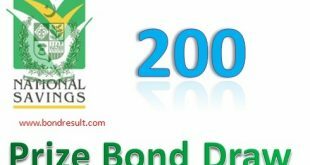 This seventy five hundred prize bond draw is years 2nd draw and the next draw will held in the month of August 2018 according to the draw schedule of National savings. Are you looking Rs. 7500 Prize Bond Draw # 74 that will be held in Hyderabad dated 02 May 2018 today. The prizes first category of 7500 Prize Bond draw will give you a lum some amount of Rs. 15,000,000/- but that have only one lucky winners right. The second prize category having Rs.5,000,000/- (Fifty Lac amount) is for three lucky winners and you may be one for them. The is great amount of money in form of winning this cheap prizesbond. The third winning category have only RS.93,000/- (Ninty Three Thousand PKR). Any one prize that have you won can be drawn from the National savings office, State bank of Pakistan or the brokers in your nearby cities. 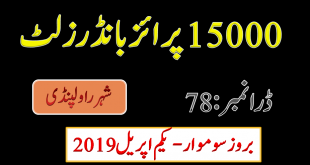 The results of 7500 prize bond list 2018 Hyderabad are coming on this page with all category prizes having the 1,2, and 3rd prize bond winners list announced by National savings of Hyderabad Pakistan. You may use search features to get prize bond 7500 result 2018 in search with ease and may save your time. The Rs. 7500/- prize bonds worth 74th draw will be held in Hyderabad dated May 2m 2018. According to a presenter of the National Savings Hyderabad , first position winner will be awarded a prize of 15 million Pakistan Rupee, while 03 prizes of Rs. 05 million each have been reticent for second winning category of prizebond holders. And the, third prize of Rs. 93000/- will be honored to each of 1696 position holders in this draw. The complete detail of prize bond 7500 list 2018 will be updated here on 02/05/2018 that you can see at the end of this article. In this draw of Prize bond 7500 May 2018 you may see the variation of winning prizes lucky numbers and perfected by various prize bond formula maker. The most favorite digit for the first prize categories is 8, 6 and 4 number that is mostly suggested by Ziddi murshid and other Baba’s. The second prize lucky number winners suggestion is open is 3-4-9 and center is 0-4-6 that you know from others prize bond makers. So what is your suggest keep in mind and invest accordingly. So wait short for 7500 Prize bond result May 2018 on this page. So keep visiting this page. The papers of prize bond list 7500 2 May 2018 are roaming all over the Pakistan and you can find appropriate list of favorite numbers any where you consider best.